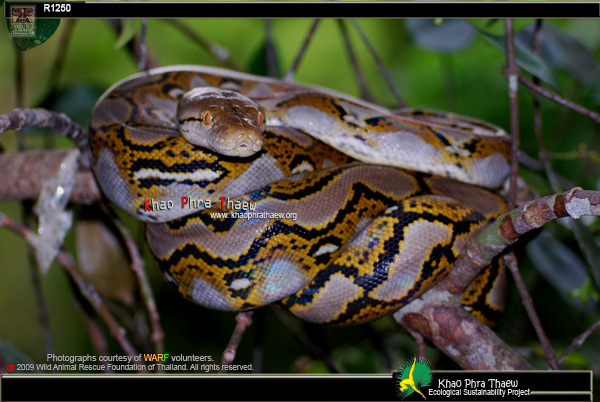 Juvenile Reticulated Python as found in tree. Description: To 1000cm long. The largest snake in Asia, and the longest snake in the entire world. 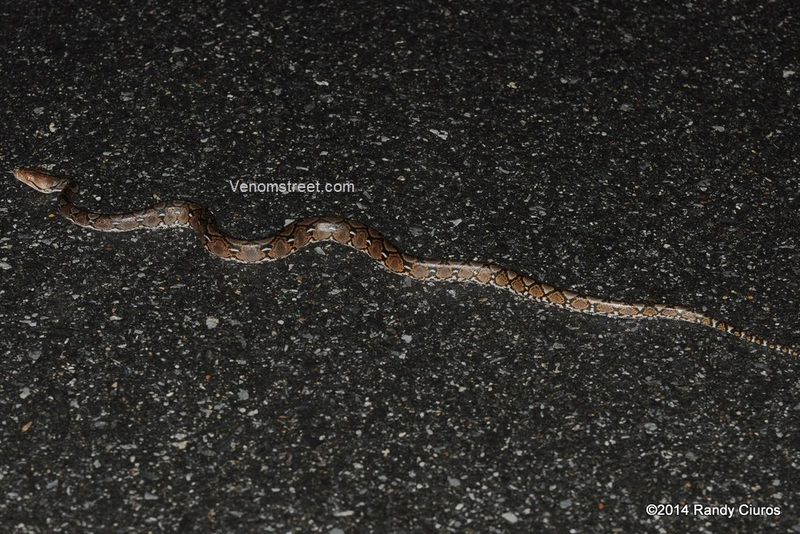 Body is brown with a beautiful black, yellow, and white “reticulated” pattern that gives the snake its name. The head is mostly unmarked other than a black line along the top of the head between the eyes. 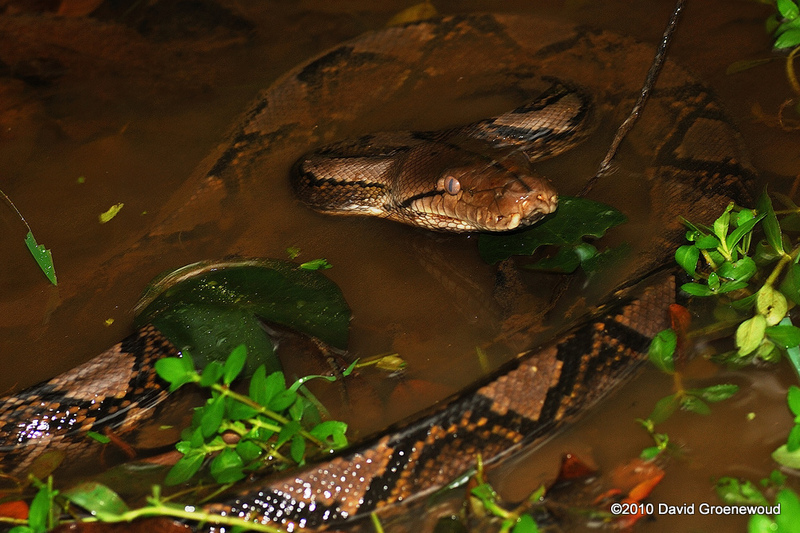 Similar Species: The Burmese Python has an arrow-like dark marking on the top of its head and rows of black-bordered dark brown blotches on its body. Habitat: Found in a variety of habitats, including forest, scrubland, grassland, mangrove swamps, and agriculture. Often spends time near the edge of water bodies. Has adapted to urban areas and can even be found in the middle of Bangkok, where it appears to travel via canals. Comfortable in trees and is a strong swimmer. 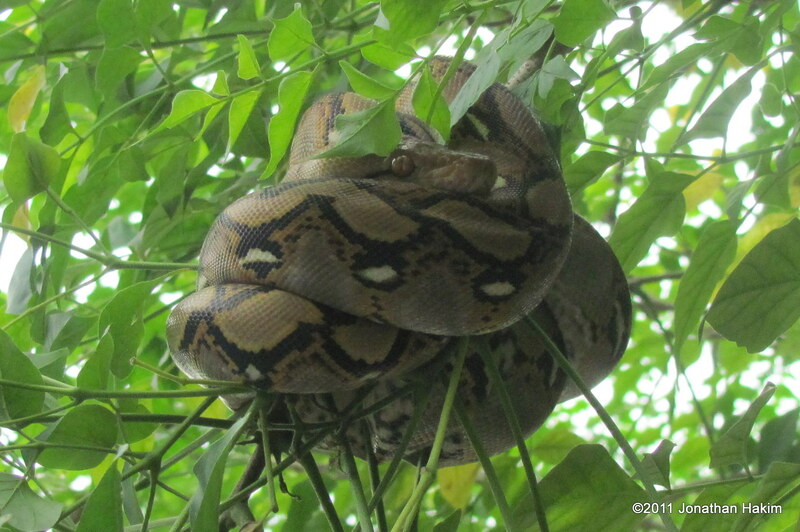 Place in the ecosystem: Despite its enormous size, the Reticulated Python feeds mainly on rats in urban areas, helping to control Bangkok’s rodent population. The largest adults eat larger mammals (such as pigs, deer, cats, and dogs). 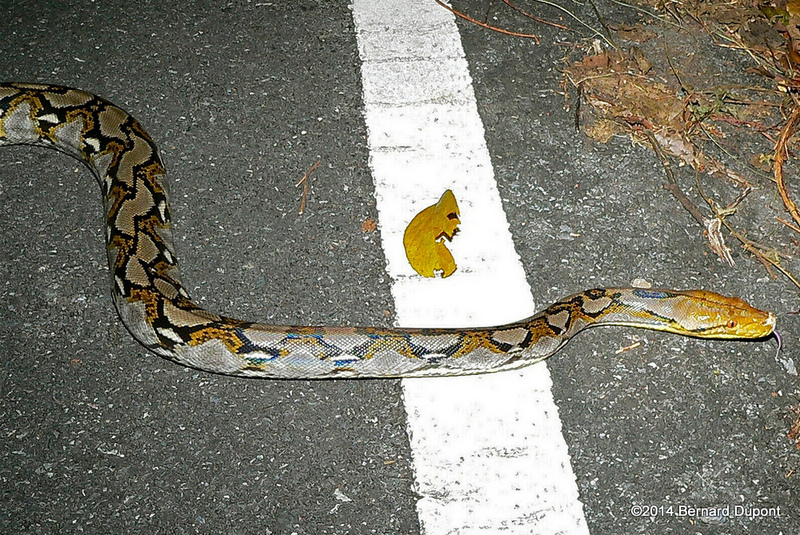 Adult pythons have no predators in the Bangkok area, but the hatchlings can be eaten by monitors and large birds of prey. 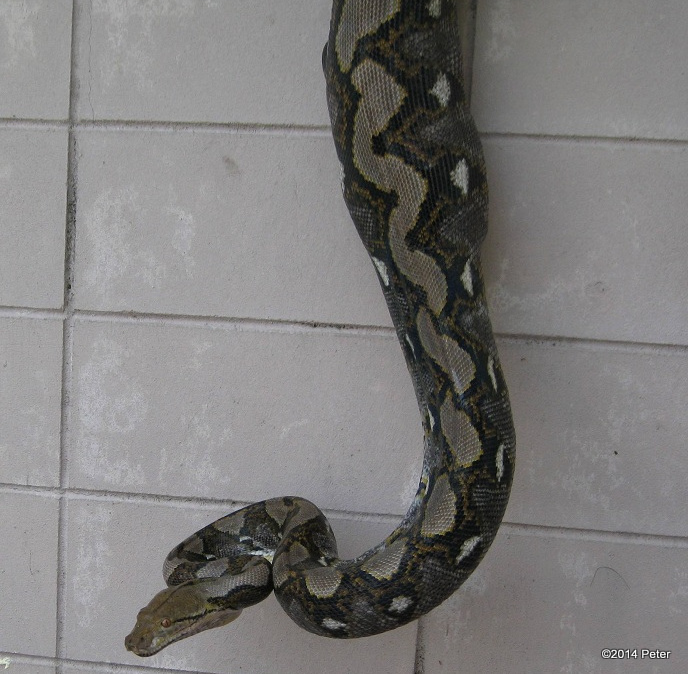 Danger to humans: Though it does not have venom, the Reticulated Python can be a threat to humans on size alone. Even the juveniles are big enough to inflict a nasty bite with their large mouths and long teeth. Larger pythons could potentially constrict and suffocate a human. Care should be taken when going near a large python, and pythons over two meters long should not be handled except by those experienced with large snakes (preferably a team of at least two for any snake over three to four meters long). This being said, pythons rarely attack humans and very few fatalities have been credibly reported. 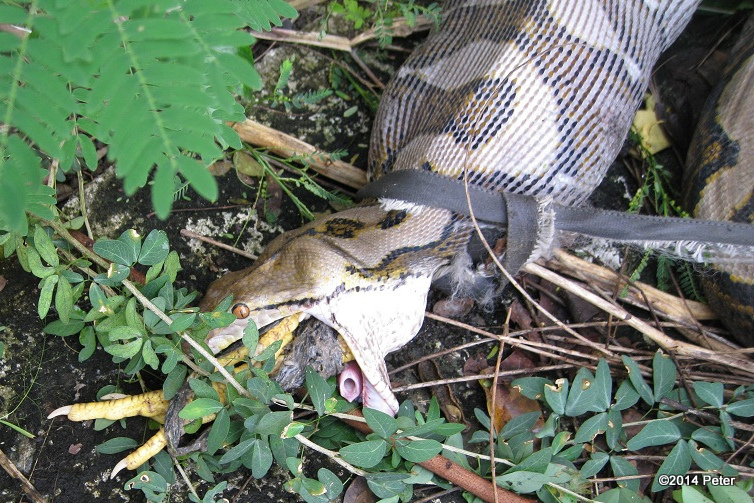 Conservation status and threats: The Reticulated Python is killed for its meat and skins and captured for the wildlife trade. It is listed in Cites Appendix II. Interesting facts: The large scales lining the lips of the Reticulated Python contain heat-sensitive pits that allow the python to sense its warm-blooded prey in the dark. A Reticulated Python found in 1912 on the island of Celebus in Indonesia measured 33 feet, 9 inches long and is the longest snake ever reported. OMG I wish someone would release a few in Chatuchak market. The warrens of thousands of stalls are sort of raised off the ground and there is a plague of very large rats under there. They aren’t shy either. 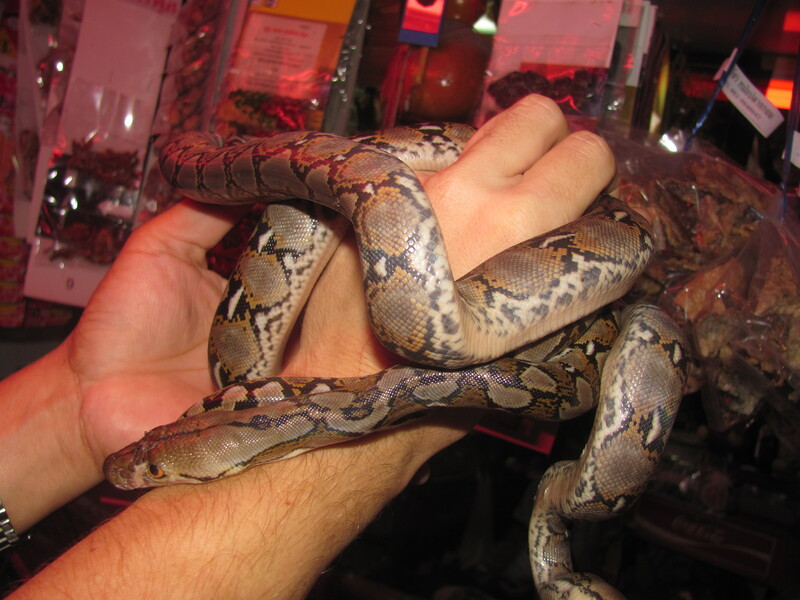 I have seen some lovely morphs of these at Chatuchak for sale as pets but I find reticulated pythons a bit on the strike happy side for my liking so always give them a wide birth. I’m sure they visit there from time to time. The limiting factor probably isn’t the amount of food, but the lack of hiding places. Just not enough options for them to stay undetected in a busy place without someone finding them and getting rid of them.